Shimmerz Paints: 10 steps to an easy page. 10 steps to an easy page. Back again today with another Shimmerz Share. This one is a nice easy Shimmerz page. This one was one I had planned for another page. I sprayed the page with Vertigre Vibez.....a nice dark colour, which I then sprinkled heavily with Molten Metal Enamelz, and then tipped off the loose powder and heat set it, adding much more texture.......after I did this, it was just too much for the page I was planning, so I set it aside and went in a different direction for that page. Come this layout, I decided now was the time to use the partially done page to record something I want to remember, seeing this will be my last bub. It came together super easy and very fast. (Love it when that happens!) The first time I tried with this background I worked on it for ages before deciding the page had to go...it just wasn't working. 3. Heat set the powder. 4. 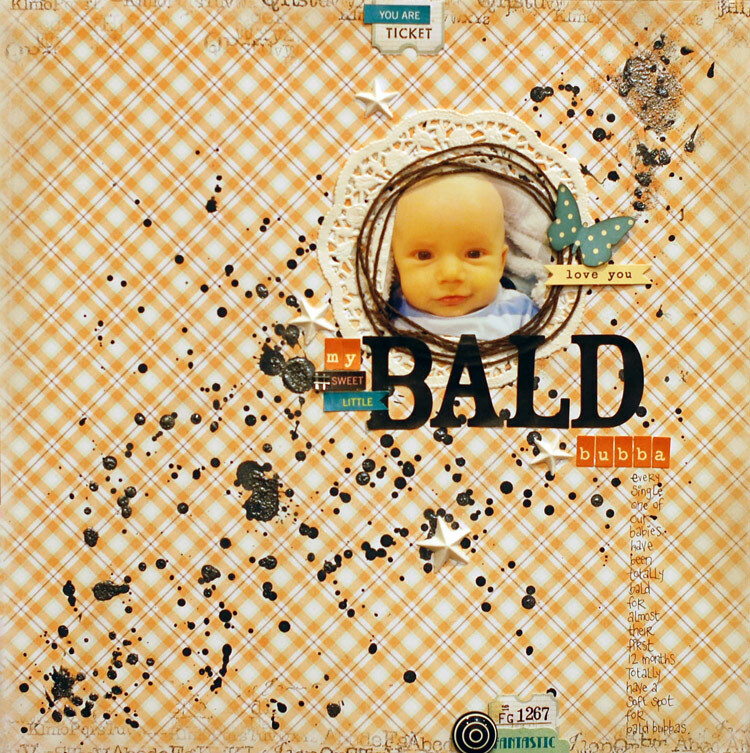 Select a favourite text stamp and stamp into some Pearlz Paint (Esspresso) painted onto a craft sheet and stamp off a little, then stamp off the top and bottom edge for added texture. 7. Coil some string and secure it in several places with dobs of wet glue (Helmar 450 Quick Dry). Hope you can fit in some 'playtime' and maybe follow these steps to your own easy page. 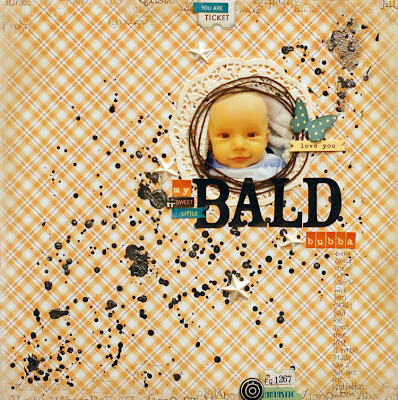 Bald is beautiful and so is this LO.